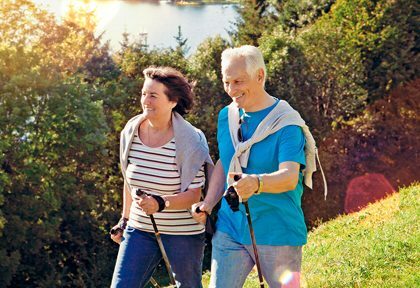 Here are some tips on how to manage a healthy lifestyle if you’re living with Multiple Sclerosis (MS). Nutrition:Strive for a diet that is rich in vegetables, fruits, whole grains and fish, and also low in sugar, salt and red meat (which have been linked to inflammation). For guidance on food choices and portion sizes, consult Canada’s Food Guide (available online; see “Resources”) or talk to a registered dietitian. Smoking:According to the MS Society, smoking increases the likelihood of accelerating the progress of MS from RRMS to PPMS. Talk to your physician about quitting and take advantage of free resources for smoking cessation (see “Resources”). Mental health:Clinical depression is a symptom of MS, and it occurs in about half of people at some time in the course of the disease. Medication and counselling can prevent depression from worsening, and MS support groups also provide vital support. This is your best source for up-to-date MS information. Visit the website for support and services, physical activity guidelines, research news and ways to get involved. Learn about nutritious foods and portion sizes, and create a personalized food guide online. Visit this site to find a registered dietitian. Canadians in Ontario, British Columbia and Manitoba can also ask questions through provincial call centres at no charge; see website for details. Free, personalized tools to help smokers quit. Bayshore is pleased to provide information that educates you as you strive to care for your loved ones. This newsletter contains information about MS. The information is not advice and should not be treated as such. For more information on multiple sclerosis, please consult your doctor.